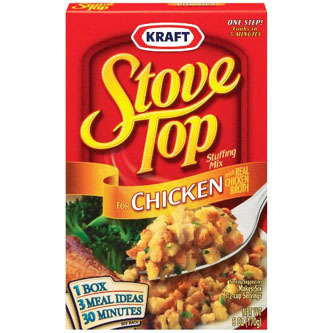 Stove Top Chicken Stuffing is made with real chicken broth. Ready for the table in 5 minutes, Stove Top Chicken Stuffing banishes boring from the dinner table! Boil 1.25 cups of water in a saucepan. Add 4 tablespoons of butter or margarine to the water and allow it to melt. Pour the stuffing mix into the boiling water. Turn off the stove burner. Stir the mixture into the water. Cover the pan with the lid and let stand for 5 minutes. Fluff with fork and serve.